We provide artist grade printing from our 64” (1626mm) Large Format EPSON Printer that pairs aqueous pigment inks with archival-grade fine art paper, photo paper, canvas and matboard to create museum-grade archival reproductions. n with superior fidelity and tonal gradation. We use Epson’s latest UltraChrome® PRO all-pigment aqueous ink for accurate colour with an enhanced gamut, Dmax and image durability. NEW Ultrachrome PRO inks provide MORE contrast, MORE colour gamut and INCREASED light fastness. We provide10 Colour ink configuration with up to 99% PANTONE® coverage. 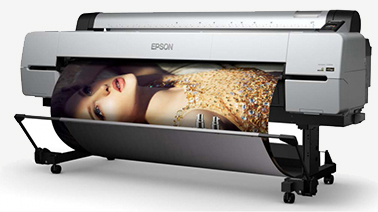 We can print true photo quality images - up to 2400 x 1200dpi. We ensure excellent image stability. Our prints dry quickly to become water and scratch resistant. Output can be stored for extended periods with excellent light fastness. We provide flexible operation by supporting a wide range of media. Our printer handles rolls based stock up to 64inch (1,626mm) wide and sheets up to A1 Super B0 (including A0). Supports matboard up to 1.5mm thickness.